OK, they aren’t. You see, I was finally ready to share Texas Cliff’s fantastic bacony migas, but found the recipe email had vanished in the great black void of lost messages. So instead, I bring you Dishboy Scott's Cream of Turkey Soup. 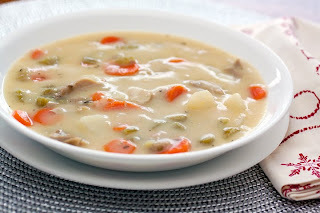 I had a heck of a cold not too long ago and Scott brought over this really wonderfully simple turkey soup made from frozen Thanksgiving leftovers. You can make this with rotisserie chicken if you don’t have any turkey laying around. Either way makes a pot of warm, comforting old-fashioned soupy goodness. This soup was so welcome that day of the great cold. I hope you’ll enjoy it as well. 1. Melt butter over medium high in a large pot. After the foam settles down add the celery, carrots, onion and thyme. Season with salt and pepper. Cook until carrots start to soften. 2. Stir in the flour and cook for 3 to 4 minutes scrapping the bottom of the pot. Add a bit of the broth to deglaze the pot, scraping up the stuff stuck to the bottom. Add the rest of the broth and water and bring to a boil. 3. Add the bouillon and potatoes. Bring back to a high simmer and cook until the potatoes are softened. 4. Lower the temperature and add the turkey or chicken and milk and heat until warmed through. Salt and pepper to taste. Such a classic comfort food! Next time I get sick, I know what I'll be cooking! But I have to say...I can't wait to see those migas! Mmmmm...I love soups. I think I could eat soup everyday. This one is definitely on the "to make" list! Any recipe that starts with 1/2 cup of butter has to be good! LOL! I'm looking forward to that miagas recipe b/c I've never even heard of them. 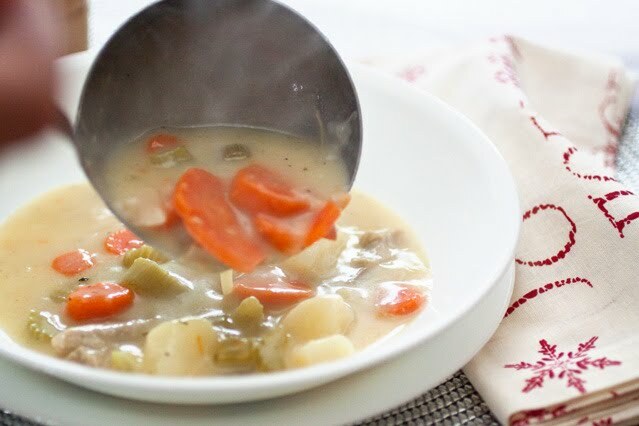 We're having a different turkey soup for dinner tonight, but now I kind of want this instead! Way to go dishboy! This looks wonderful. I usually make brothy soups so what a nice alternative. This looks SO much better than what I usually scoop out of the can. Thank you for sharing this with me. I hope your weekend bursts forth in hope and joy! Oh, that just looks ridiculously comforting. 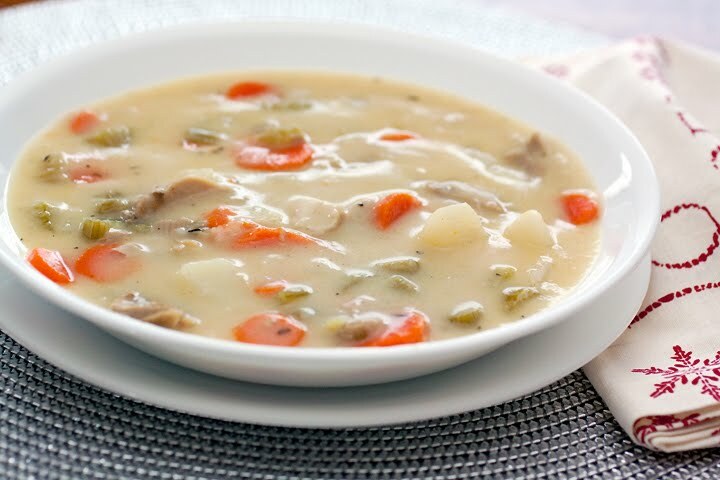 This a healthy hearty soup that's good for the soul! The thyme is a perfect herb for this soup. Nice recipe. so good on a cold day, I'm sharing this one! We made this for dinner tonight - it was delicious! !